Before this knockout round of the Champions League began, I called this slate of European games a “make or break” season for Gus Johnson as a Fox Soccer announcer. In his second year with Fox Soccer, this would be the time the narrative would be set on Johnson’s viability as a soccer announcer. Without the ability to lean on his rookie status, this is the time for American soccer fans to embrace or reject Gus Johnson as the present and future voice of the sport. He’s not a rookie anymore and the training wheels have to be taken off at some point. Although Johnson is relatively new at soccer announcing, viewers are now well within their rights to set him alongside the likes of Ian Darke and Martin Tyler. They say you only get one chance to make a first impression. That chance has come and gone. Soccer fans are notorious for being the most difficult and most demanding fanbase to please as far as television announcers go. Fox knew that and still went with the experimental route. Unfortunately for Fox and Johnson, fans are saying they’ve had enough. These were the reactions during the Champions League semifinal between Real Madrid and Bayern Munich. Please remember: This isn't really Gus Johnson's fault. He's a good company man who took on a basically impossible task. The reaction to Johnson (and broadcast partner Eric Wynalda) was universally negative in social media. Naturally this should come with a warning that Twitter reviews don’t speak for everybody. But it’s concerning that you could hardly find a single viewer praising Johnson or Wynalda for their work yesterday. We’re talking Tim McCarver territory, here. The feedback for Johnson & Wynalda is in the same ballpark as the vociferous outrage over Chris Berman appearing at golf’s US Open. This shouldn’t just concern Fox executives that have expressed their commitment to this grand experiment, it should alarm them. It should send them into a panic, cracking each others’ heads open and feasting on the goo inside. If fans are this opposed to Johnson now, it might be too far gone for them to change their minds. Even if Johnson shows slight improvement year over year from now until 2018, he will have already lost fans by the time the World Cup comes around. That’s the cold, harsh reality that Fox is missing. If you watched yesterday’s game between Bayern Munich and Real Madrid and compared it to last year, there was certainly a marked improvement. Johnson seems more comfortable calling the flow of the game and not just the big moments. Fans criticize Johnson for sounding like he’s reading off the media guide to drop in factoids throughout the broadcast, but that’s a particularly harsh and unfair criticism. If it was another announcer dropping those stats, he’d be applauded for being informative. But there are clearly still enough mistakes and enough moments when Johnson mixes up his verbage or doesn’t execute a call that causes fans to turn away. And all of this is not withstanding the fact that Fox has still not found a reliable partner for Johnson as an analyst. 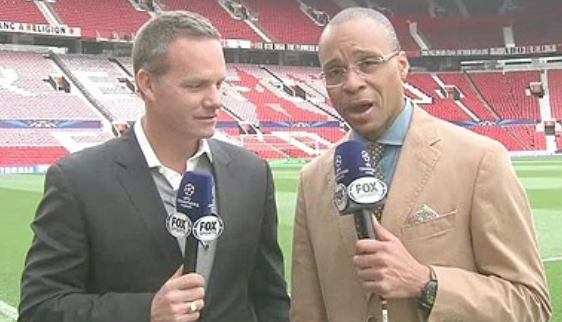 Ian Wright and Warren Barton had their respective spells and after watching yesterday’s Champions League semifinal, Eric Wynalda does not seem to be the answer either. At times yesterday it was difficult to tell if the pair were in the same broadcast booth, let alone on the same continent. ESPN and NBC have set the bar ridiculously high for quality soccer coverage in this country. We’re light years away from the days of Fox Sports World and ESPN’s coverage of the sport as a foreign novelty. To their credit, Fox has improved their overall soccer presentation. The studio is a lot better, the tactical analysis is better, and there are no more Michael Strahan segments. However, the network has come under fire when compared to their competitors because Gus Johnson isn’t up to the standard of Arlo White, Ian Darke, or Phil Schoen (anyone who says there aren’t any good American soccer commentators is just being lazy). If Piers Morgan walked into the ESPN studios to analyze soccer, Bob Ley would self-combust. As a soccer fan and a fan of Gus Johnson, I hope this doom and gloom is not the final chapter. I hope there’s still a way forward and viewers can remain patient while Johnson grows into a top flight soccer announcer. If Fox and Gus are successful, the long term impact for American soccer would be a huge positive. Soccer fans should be rooting for Fox to succeed and carry the coverage of the sport forward. But it’s tough to ask viewers to be patient for two years during the most prestigious yearly soccer tournament on the planet over a broadcasting experiment. I’m afraid Fox is inching ever closer to the reality that it’s going to be nearly impossible to win the very vocal, loyal soccer fan back if major changes aren’t eventually made. Their minds might already be made up.